So why do people usually get married? 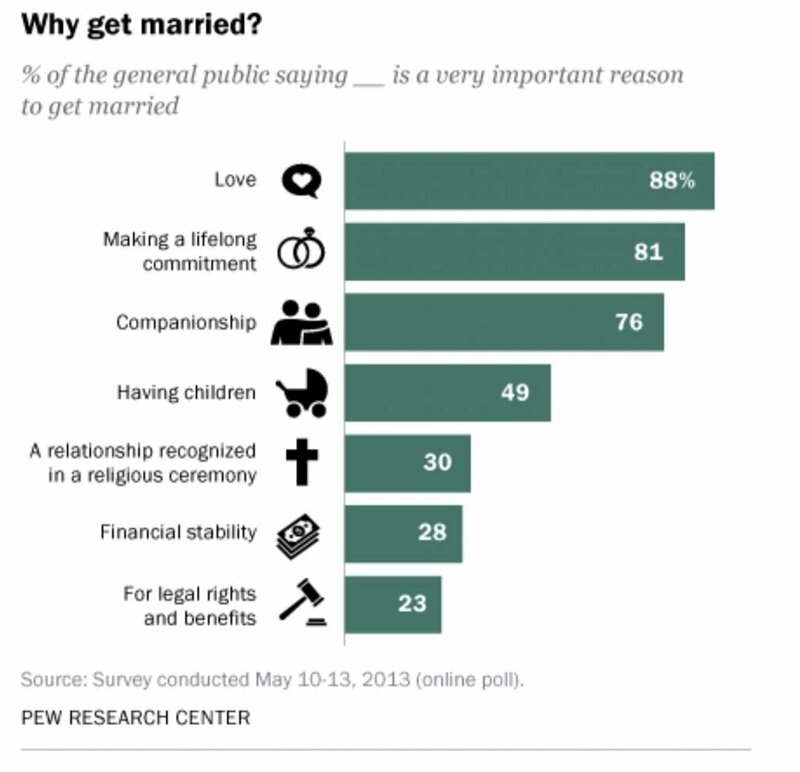 A Pew Research center survey found the most popular answer are Love, making a commitment and companionship. Interestingly, a similar Pew Research Center survey reported that about 50% of American adults are married, down from the peak of 72% in 1960. In fact, over the years, there has been an increase in people who have never married. About four-in-ten never-married adults (41%) who say they may want to marry in the future say that not being financially stable is a major reason they are not currently married (which is a topic for another day.) While others choose to remain single or cohabitate with their partner and have a family, purposely to avoid the ‘shackles’ of marriage. So are there more hidden practical reasons for getting hitched? Oh you bet. There is the potential to receive spousal Social Security benefits based on a spouse’s work record. the working spouse has filed for benefits. For example, if Fred and Wilma are married and Fred stayed home raising Pebbles while Wilma worked down at the quarry, Fred would be entitled to receive up to half of Wilma’s Social Security benefit once she files. If Wilma’s monthly Social Security benefit is $1000, Fred could receive up to $500, making their monthly household income from benefits alone total $1,500. Remember that Wilma, as the primary wage earner, has to file for her benefits first in order for Fred to file for and begin receiving his spousal benefits. If Wilma is still working and decides to wait to file, Fred can’t file for his benefits yet. Even though Fred doesn’t have a work record for Social Security purposes, he still has a Full Retirement Age (FRA) which is based on the year that he was born. His FRA is the age that he can receive 100% of the benefit to which he is entitled. He can file as early as age 62, but if he does, his benefit will be reduced to 32.5% of Wilma’s full benefit. In order to receive his full spousal benefit (50% of Wilma’s full benefit), Fred should wait until he reaches FRA. The earnings test applies to spousal benefits. Remember that if either Fred or Wilma file for benefits early and continue to work, a portion of their benefit will be held back if they earn more than $17,040 before the year they turn FRA https://www.ssa.gov/oact/cola/rtea.html. First, they will need to determine the amount of each of their benefits; the spouse with the higher benefit is the primary wage earner. The lower-earning spouse will then be potentially eligible for two benefits; Fred as the lower earner may be entitled to his own work benefit and a spousal, but would receive the higher amount of the two benefits—not both*. Additionally people who have dipped their big toe into the marriage pond– and then got out—exes may be eligible for spousal benefits if they meet certain requirements. Kris and Bruce Jenner were married from 1991 to 2015, Bruce is over the age 62 but Kris is still in her 50s so they would qualify yet for spousal benefits. If you meet these requirements, you may be entitled to receive up to 50% of your ex-spouse’s benefit. Note that all except one of the caveats listed above also apply to exes: you may be entitled to receive a benefit even if you’ve never worked but as long as your ex-spouse is eligible; your spousal benefit may be reduced even further if you file earlier than your FRA; and the earnings test applies if you file for your benefit early and continue to work. The one difference for exes is that the primary wage earner does not have to file in order for the ex-spouse to file for his/her benefit. 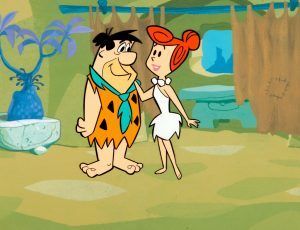 So, if Fred and Wilma were married for 10 years and divorced and never spoke again, as long as Fred is at least age 62 and unmarried at the time of filing, he can file for and start receiving his benefits without have to speak to Wilma! If you marry, you most likely did it for love and companionship, but a nice extra kicker is that Social Security can provide substantial benefits for married couples and exes. But there are caveats so it’s important to understand the benefits and tradeoffs of different claiming ages, coordinate spousal benefits and to make sure your Social Security plan fits within your larger retirement plan. *One exception to this rule applies to individuals born on or before January 1, 1954. Individuals can file a restricted application at FRA and choose to receive only the spousal benefit at that time. This would allow their own benefit to keep growing (by waiting to file, benefits will increase by 8% annually for every year between FRA and age 70), and may later “step up” and begin receiving the higher benefit. For example, if Fred was born prior to 1954, he could file a restricted application at his FRA to begin receiving his spousal benefit and at age 70, switch to his own larger benefit. Because of legislation passed in November 2015, if you were born in 1954 or later you will not be able to restrict your application; thus, if Fred was born later than 1954 and is eligible to receive his own benefit and a spousal benefit, when he files for one benefit, he will be “deemed” to have filed for all his benefits and will receive the higher amount of the two.